I added a Blue Sea ST four-circuit blade fuse block along with a five-gang common bus to handle the 12V/5V outlet, the Trail Tech Equinox Lamps and the additional 12V outlet I'll install before winter. 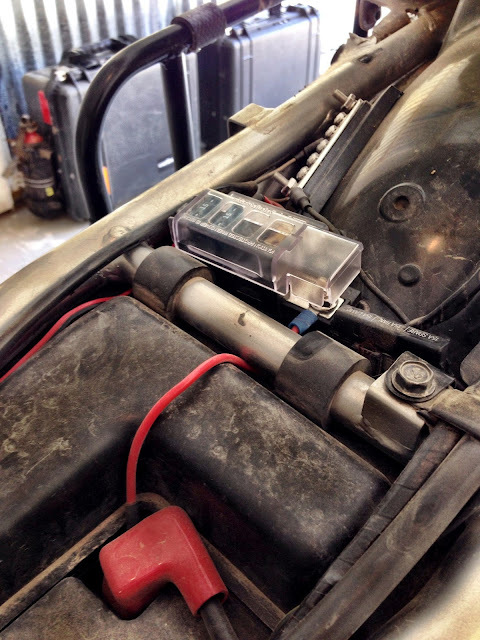 The Blue Sea box is small enough to tuck under what little room is beneath the seat, but, like the battery and stock fuse block, it's still be at the highest point possible on the bike. The box has a clear plastic cover protecting all the circuits. It's powered directly from the positive battery terminal. The common bus is pulled from the NEG post. I like a separate common to bring all the accessory leads to. Makes trouble shooting easier. I've done a similar set-up on my H3 with a 100A breaker in between the Blue Sea box and the battery.